Inter Scaldes in Kruiningen is one of the grandest and most renowned Michelin-starred restaurants in the Netherlands. The restaurant is housed in a stunning thatched country house, set in beautiful grounds. Also on the grounds is the 'Manoir', with its 12 elegant bedrooms and suites. The village of Kruiningen is situated on the Zuid-Beveland peninsula in the low-lying province of Zeeland in the south west of the Netherlands. The name Inter Scaldes refers to its location between the Oosterschelde and the Westerschelde. The name is in Latin and translates into "Between the Scheldts". For more than thirty years now, Inter Scaldes has been a favourite culinary destination for many Dutchmen and Belgians. Husband and wife team Jannis (chef) and Claudia (maitre d'Hotel) Brevet are the second couple to own and run this restaurant. The first owners Maartje (chef) and Kees (maitre d'Hotel) Boudeling had started the restaurant in 1968 and after having been awarded a first star in 1977, Maartje Boudeling was the first female chef in the Netherlands to be awarded two Michelin stars in 1984. In 2001 Jannis and Claudia took over. They managed to retain the two Michelin stars and have done so ever since. The couple didn't have an easy start however; two years after they bought Inter Scaldes the main building with the restaurant was almost completely destroyed by a fire. Apart from the facade and a sidewall, it had to be rebuilt completely. Inter Scaldes is open for lunch and dinner Wednesday till Sunday. The restaurant offers a lunch menu (4 courses €95), a dinner menu (5 courses € 125), the menu Tradition (8 courses €165, lunch and dinner) and there's an a la carte menu. I had lunch with my husband at Inter Scaldes on Sunday 9 September 2012 and we both ordered the menu Tradition. With our aperitifs we were served three appetizers: (i, bottom) Beetroot jelly cylinder filled with duck foie gras served with a fruit and nut chutney and a sweet olive crisp; lovely flavours and the chutney was a nice touch - (ii, top left) Smoked fish mousse 'sandwich': curry crisps with a lovely light smoked fish mousse filling, which combined well with the Tosazu jelly cubes - (iii, top right) Smoked tea and tomato mousse, poppy seed dust and confit tomato; delicious light smoky flavours and the mousse had a wonderful light and airy consistency. Next the amuse bouche arrived: 'Caprese 2012'. A perfectly clear and well-set, tomato jelly topped with dots of tomato, basil and mozzarella crème. A great take on this classic, with very pure and clean flavours. Nice invigorating freshness from the tomatoes and lovely creaminess from the mozzarella. Stunning pointillistic presentation on a beautiful plate designed by Pieter Stockmans. 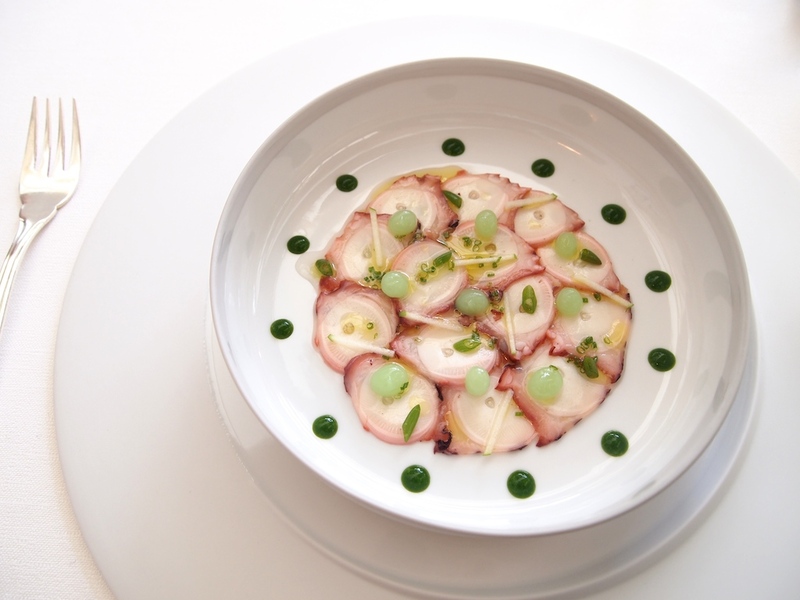 Pointillism has been a source of inspiration for other chefs too and in this case Jannis Brevet is in good company; a very similar dish can be found on the menu of Fréderic Anton's three-star Pré Catelan in Paris. First course of the tasting menu: Northsea crab, caviar, avocado, yoghurt. A beautiful avocado rouleau filled with lovely fresh white crab meat, lightly dressed with lemongrass vinaigrette. Delicious crab with the perfect touch of lemongrass. The avocado rouleau, generously topped with Dutch 'Anna Royal' caviar, was served on top of a 'mirror' of yuzu jelly. Also on the plate was a dollop of light yoghurt cream and small dots of silky smooth avocado cream. The yoghurt and yuzu added a lovely touch of acidity to the dish. A wonderful light and elegant starter that showed true craftsmanship, beautiful balance between rich and fresh flavours and well-judged yuzu. Second course: Pétoncles (queen scallop), black truffle, tomato, bay leaf, chervil. Lovely fresh pétoncle tartare, served with chopped black truffle and a tomato and bay leaf foam. Pure flavours but very delicate. For my palate the tomato and bay leaf foam was a bit too subtle; the bay leaf flavours could have been a little more intense. The third course was called 'Peking' (Dutch for Beijing) and was served as two separate dishes. First duck foie gras topped with a (slightly wobbly) hibiscus jelly, served with a smooth almond puree, an apple and passion fruit puree that delivered sweetness and sharpness and a fig chutney. This was accompanied by a cup filled with a delicious, rich and velvety Peking duck and duck foie gras mousse, topped with a popcorn foam and cocoa dust. A lovely combination of flavours, indulgent yet elegant. On to the fourth course. Dover sole, bay leaf, lemongrass, Comté cheese, Granny Smith apple, broccoli, fennel. Perfectly cooked fillet of Dover sole with a beautiful golden strip of gratinated Comté cheese on top, served with a wonderful bay leaf and lemongrass jus. I loved the touch of freshness from the lemongrass. The sole was accompanied by three purees (cauliflower, fennel, broccoli and yuzu) which all had a wonderful smooth consistency. Nice earthy flavours from the cauliflower puree; lovely pure and clean flavours from the broccoli and yuzu puree. The fennel puree was great too and had a lovely depth of flavour. Fifth course: Octopus, risotto, orange blossom, dashi, lovage. A truly wonderful risotto, made with dashi stock, served with beautifully tender octopus that was topped with a delicious, concentrated jus, olive oil and finely chopped vegetables. The citrus notes from the orange blossom imparted a lovely freshness on the dish. The lovage provided warmth, herbiness and an incredible depth of flavour. A marvellous, comforting and creamy dish that had a lovely richness to it and an amazing aftertaste. Beautiful cooking on all levels. Sixth course: Oyster, parsnip, bone marrow, beef jus, sauerkraut. Excellent juicy oyster (slow-cooked at 36°C) tartare, accompanied by a light and velvety parsnip puree and a sauerkraut foam. The bone marrow and beef jus delivered a touch of richness. A lovely and well-balanced dish. Seventh course: Pigeon, carrot, parsley, ginger, lime. Beautifully cooked tender and tasty pigeon served with some lovely sweet braised carrots and a divine ginger and lime jus that was very well-balanced and that added a lovely zing to the dish. Also on the plate was this fantastic pure parsley puree. Final and eighth course: Pineapple, 'Ile flottante', vanilla, cider vinegar, sandelwood, corn, basil, curry, champagne (three separate dishes). First a large slice of pineapple roasted on sea salt, sandalwood and cloves, served with a creamy basil sauce. The pineapple was nice and juicy and the sandalwood and cloves added a lovely savoury touch. In the glass was a champagne and curry sorbet and a pearl barley cracker. Lovely sweet and creamy sorbet with subtle curry flavours. Finally cubes of 'Ile flottante' and sauteed (in cider vinegar) pineapple accompanied by a clear vanilla cream sauce. Again nice juicy pineapple and combined with the 'Ile flottante', a lovely sweet and sticky dish. A wonderful dessert with a inspired interplay of sweet and savoury flavours. At Inter Scaldes, Jannis Brevet creates food that is visually very attractive. The presentation is clean and focused, uncluttered. When some dishes seem like small works of art, this is not a coincidence. Art is indeed an important inspiration for his cooking, as he explains in his 2009 book "Cuisine & Art". This is not a case of style over substance however. The cooking at Inter Scaldes is contemporary and precise. Brevet elegantly integrates Oriental ingredients into classically based and carefully executed dishes. In doing so he manages to obtain a fine synthesis between East and West. The food is mainly based around locally sourced ingredients, which are prepared with great attention to detail by a chef who is clearly a great craftsman. For most people, a visit to Inter Scaldes would require a detour but this restaurant is well worth it.